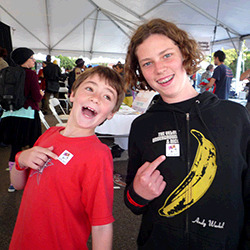 Want to purchase project kits in bulk or gifting EEME? Each month, receive a brand new EEME kit in the mail with all the materials you and your kid will need to build a new electronics project. 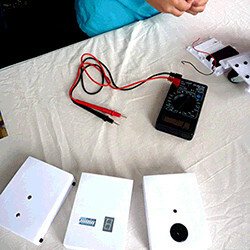 With kit in hand, go online for video lessons that will teach your kid how to build the project & explain how it works. Interactive quizzes will reinforce your kid's understanding of the how's and why's - fostering their curiosity in the technology around them. "I'm crazy about the fact that everything you need is in one kit. I'm crazy about the complete videos. 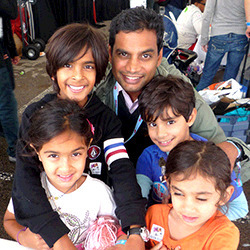 I'm crazy about being able to share electronics building with my kids." 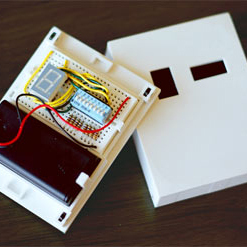 In the first project, your kid will learn about LEDs, current, and resistors by building an LED circuit that lights up when it is dark and dims when it is bright. 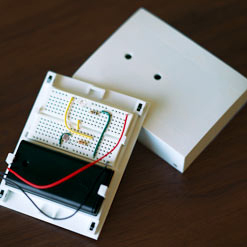 In the second project, your kid will wire up an LED display to a switch system, learning about segmented LEDs and switches along the way. 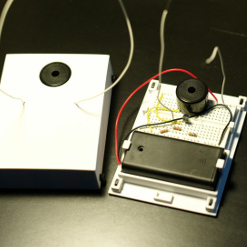 Building on top of the first two projects, your kid will move onto the more advanced topic of transistors by building an alarm system hooked up to a buzzer in month 3. ...so with each month's project, your kid will continue to develop a solid understanding of the electrical engineering concepts they'll need to know to go off to design and build their own electronic gadgets! "I have purchased other 'electronic learning' kits in the past and was in no way as thrilled as I was when I opened up this box. This project kit is the 'real deal', not just snapping pieces together, not just reading instructions on how to put it together, but real teaching designed to help us as parents teach our kids about electronics." This project really brought electronics to life for the kids, and I just really can’t say enough about having a resource like this. I could see the light bulb over my son's head go on when the light bulb on the bread board went on. This is so cool, and the fact that it got my husband and kids working together was sooooo nice. Now my 12 year old is fired up to do more electronics projects. In fact, he wanted to start tinkering with the Genius Light as soon as he was done. Throughout the entire experience, he kept saying "this is so awesome, this is so awesome." I am not (at all) very proficient in electricity, so it was a learning experience for me too! When our light finally lit up, I think we were both through the roof.